When you get behind the wheel of a SEAT car, you don’t just go for a drive, you go for an experience. One that will capture your imagination and touch your emotions. That’s the essence of ENJOYNEERING. You’ll find it in every new car model that wears the SEAT badge, including our ever-growing Ecomotive and E-Ecomotive range. It’s the philosophy that lies behind everything we do as a company. And it will be driving us to develop new and innovative concepts well into the future. You see, ENJOYNEERING isn’t just about engineering quality cars today. It’s about bringing more enjoyment to the roads of tomorrow. Today Mr. Muir introduces SEAT’s vision for the future. 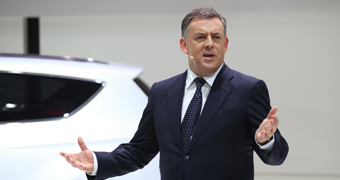 Watch his speech at the Geneva Motor Show.